The park is increasingly popular as an add-on eco-tourism experience to the beach resorts of Phuket, Koh Samui and Khao Lak. The training addresses a desire by local communities to share their knowledge of the park with international visitors. Seventeen guides are currently receiving intensive training, sponsored by Khiri Travel. The focus is on improving English skills, group leadership, knowledge of flora and fauna, safety standards, emergency responses, confidence building and initiative. The objective is to improve guide skills for the benefit of all tour operators and tourists visiting Khao Sok. The specialist training is being provided by Bodhi Garrett, founder of Andaman Discoveries, a community eco-tour operator based in Surat Thani province. 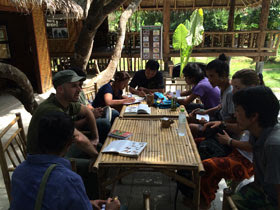 Garrett and a team of experienced foreign and Thai guides started the training on 7 May. There is about two days training per week for two months. The instruction is a combination of classes, hikes, and lake explorations. Each training day lasts 7 to 10 hours. The work is intensive. The training is personalized, reflecting the unique needs of each guide who is seeking to be a responsible leader. Training is taking place at three locations: near the Khao Sok park headquarters, at Cheow Lan lake, and at the Kilometer 82 community. The guides include trail leaders, Sok River canoe guides and Cheow Lan boatmen who want to be tour leaders and not just transport providers. Niemeijer said the training would lead to stability in services and create dedicated and responsible guides. Khao Sok is the largest area of virgin rainforest in southern Thailand. It is thought to be older and more diverse than the Amazon rain forest. 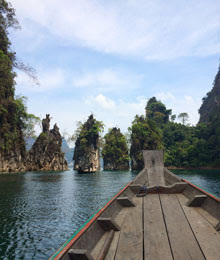 Khao Sok covers 646 sq kms of spectacular mountain and forest scenery including Cheow Lan lake. Elephants, languars, leopards, bantung, a variety of monkeys, and over 178 species of bird inhabit the park and surrounding sanctuaries. It is one of the most valuable nature reserves in Southeast Asia. In 2009 Khiri Travel also funded a training course in Chiang Mai for guides who specialize in trips into the forests of Doi Suthep national park.